Following the success of last year’s event The Friends of the Sacred Heart Parish are holding a Fashion Parade at 7.30pm in St Margaret Mary Community Centre, on Wednesday 27th September. Tickets £5 and are available from Alison Hather and Liz Sproat. Tickets are selling fast - please get one soon! Tuesday night parish catechesis continues on Tuesday 3rd October in the Parish Centre at St. Margaret Mary from 7.30 pm. This unit of reflection focuses on the series ‘Catholicism’. Please consider coming along - all are welcome. 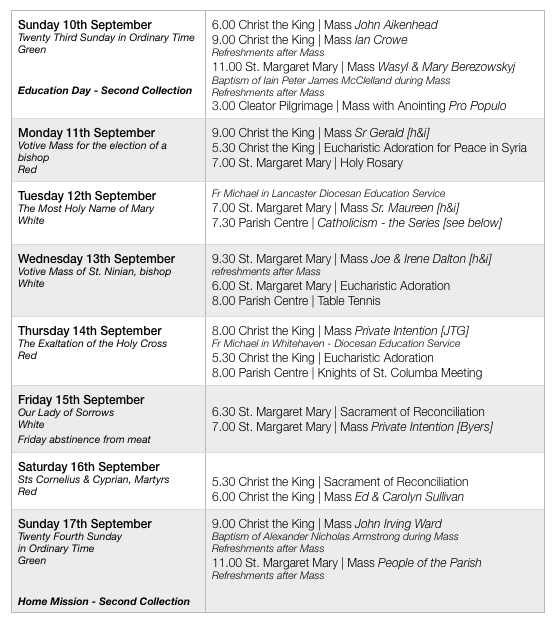 Numbers at Mass were Saturday evening - 62, Sunday 9.00 am - 102 and Sunday 11.00 am - 84. A total of 248. Thank you for the offering of £532.42 at Christ the King and £213.00 at St. Margaret Mary. The total being £745.42. Have you – or someone you know – ever thought about becoming a Catholic? Would you like to learn more about your Catholic faith? Journey in Faith presents the Catholic faith in an open and friendly way. No one is asked or expected to make any commitment. 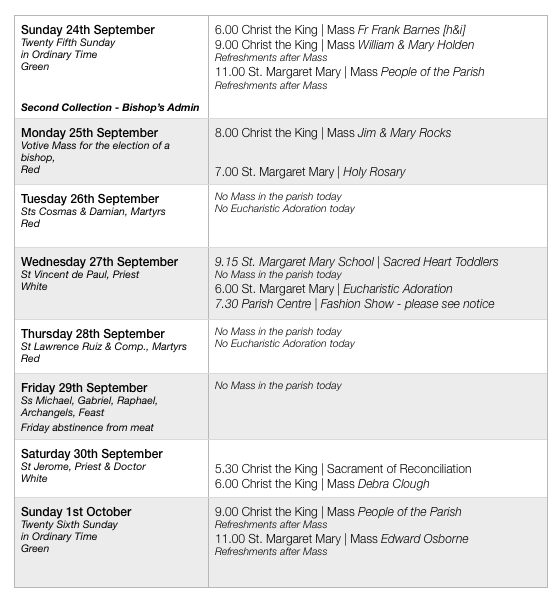 If you or someone you know would like to take part in this year’s journey in faith, please have a word with Fr Michael or contact the Rectory at Our Lady & St. Joseph’s: e-mail ourladyofeden@gmail.com or 521509. Led by Peter Cobb from Preston. To be eld on Saturday, 30 September, 10.30 am – 2.30 pm, at St Bede’s centre, Wigton Road, Carlisle CA2 7ES. 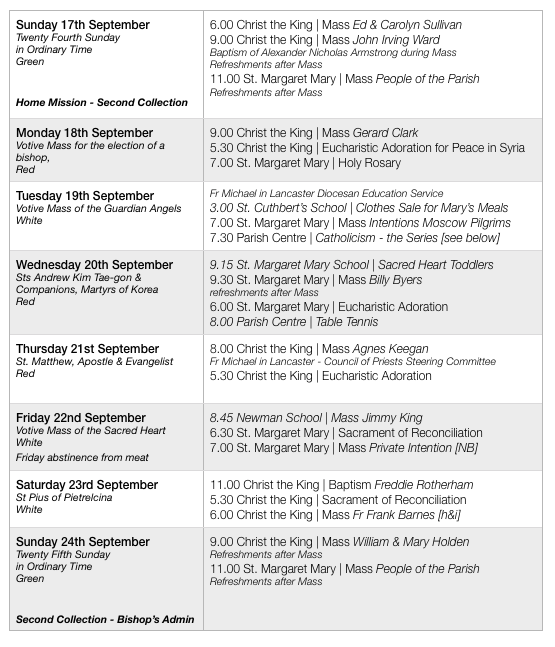 An opportunity to look at new musical settings for the Mass, psalms and Advent. All welcome. If you play an instrument, you are welcome to take it with you. If you’re able to attend, please phone C Battle on 07801 447042. Thank you for your prayers for Fr Jerome - his operation went well and he is now out of hospital and recuperating. Please keep him in your prayers. In 2016, St. Margaret Mary’s boxes raised £1207. Thank you all for your kind contributions. All are welcome to this evening event on Monday 9 October, at 6.00 pm at Waterton Hall, Warwick Square. It will include a Dementia Friends session, light refreshments, then presentations on local activities and available support for people living with dementia and their carers. For more information, contact Louise Dias, 07779-631446. 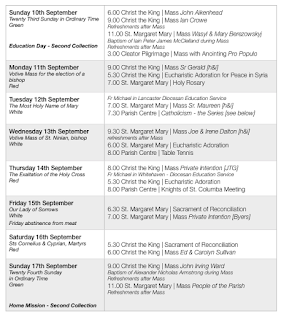 The Bishop invites all who are involved in teaching (in the Catholic or State sector), Liturgy with Children, preparation for First Holy Communion, etc, to gather with him for Mass in our diocesan cathedral at Lancaster LA1 3BT, on Friday 6 October at 7.00 pm, to ask for God’s blessing on the new year of teaching and formation. To raise funds for the new chapel at Newman School. Pie & pea supper, together with raffle and auction. Comedian & MC: Howard Nicholson. After dinner speaker: Steve Kindon. On Friday, 10 November from 7.00 pm-12.30 am at St Margaret Mary’s parish centre, Scalegate Road. Tickets £25. Please contact Paul Radcliffe on 07813-327305 or St Margaret Mary’s parish centre on 524595. Fr Michael is making a pilgrimage to Fatima this week from Monday to Friday. In case of emergency, please contact a priest at Warwick Square on 521509.